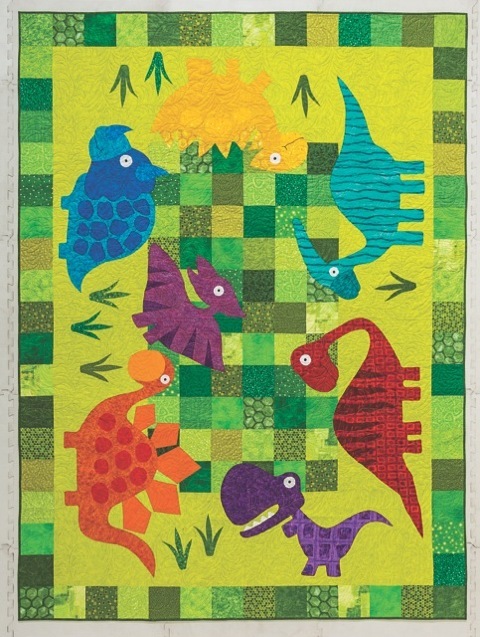 Delight a special little one with these friendly dinosaurs. The class is designed for the beginner or advanced beginner. The class will cover fabric selection, rotary-cutting techniques, basic piecing, and machine appliqué using paper-backed fusible web. The class will take approximately 8 hours. It can be broken into a series of four 2-hour sessions. 1. Instructor can go over fabric selection, giving the students time to choose and purchase the needed fabrics for the quilt top. 2. Reassemble the students to give a demonstration on rotary-cutting techniques and cutting instructions for the quilt background. Student homework: Cut the background pieces for the pieced center, inner border, and outer pieced border. 1. Arrange and sew together pieced center and inner border. 1. Trace and prepare appliqué pieces. Student homework: Student should have traced, cut, and numbered all appliqué pieces. 1. Fuse and appliqué pieces to the quilt top. NOTE: Session 1, in particular, is a great opportunity to allow your students to shop. Help them select fabric and go over any cutting supplies needed (rotary cutter, rotary blades, acrylic ruler, cutting mats). Be sure to have enough fusible web available as the appliqué pieces are large, allowing you to sell not only fabric but fusible web as well. Encourage matching threads for the different appliqué pieces for added sales.